Although ants are not very harmful, to many people, they are some of the most annoying pests of all. With just the smallest leftover crumb in your home, a long line of ants can quickly appear. Ants are so small that they can enter your home nearly anywhere. They also can get into places where you can’t see them. If you suspect that your home is being overtaken by ants, make a commitment to truly remove these pests from your residence by partnering with the professional team at Eco Tech. Sure, you can go to the local home improvement store in Ramsey, MN to purchase bug removal spray, but it is not as effective and also may be harmful to humans and pets if they come in contact directly with the spray. Instead, allow our dedicated team to provide you with our all natural, effective ant control products that are safe for everyone in the home. By combining our more than 15 years of ant extermination and our passion for serving the great community of Ramsey, MN, you will receive the best care and service on the market. Times have changed and people shy away from signing a contract. We totally understand that, which is why we do not require contracts for our services unless you make the request. Not only are our service fees extremely affordable, but you also receive a four year service warranty on our ant extermination services as well. 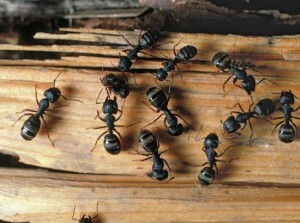 Colonies – It is rare that you only see one single ant when they invade your home. Ant colonies can contain up to 300,000-500,000 ants. That size colony is not something you can manage on your own. Finding the Nest – The best way to assure that no more ants invade your home is to track down the nest and exterminate them right from the source. Finding the nest can be very difficult, however our team has years of experience under their belt. Different Ant Species – One issue with ants is that there are so many different ant species, and they react to different treatments. No need to worry, our team can distinguish the difference and apply the proper extermination treatment. So, if you live in Ramsey, MN and are having issues with ants, give Eco Tech a call today at (763) 785-1414. Our experienced team is ready to remove those ants as quickly as possible!